A second half of the 19th century patinated bronze sculpture of a standing woman signed Malvina Brach. A large marble and bronze sculpture of dancing woman with a tambourine, second half of the 19th century. A patinated bronze sculpture of Apollo with an ormolu-mounted marble base. Probably, Italy, 19th century. 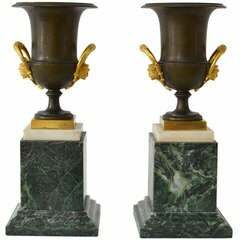 A fine pair of medici shaped patinated bronze urns with gilt bronze mounts on green and white marble bases. Possibly Italian and made circa 1820. Patinated bronze sculpture of a seated woman by H. Pie, circa 1900, Original warm patination Dimensions: 17" x 12” D x 32” H.
Benson A. Selzer (1921-1999) was an American artist, known for sculpture and painting. Eugène Canneel (1882-1966), Belgian school. Sculpture buste of a woman in patinated plaster.